This looks more like the map I grew up with. I would note that each of those blue going red districts was an anti-gun Democrat being replaced by a pro-gun Republican. 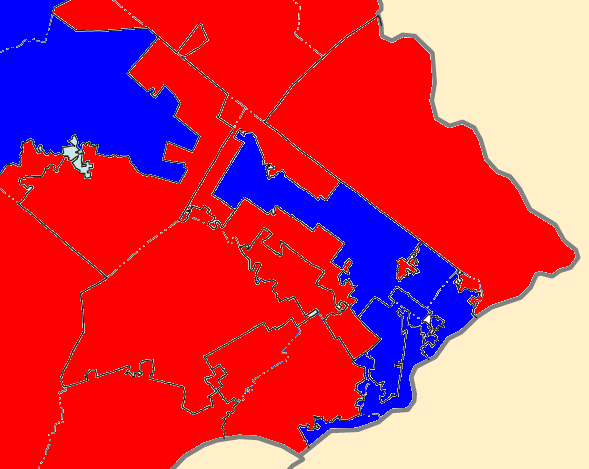 In addition, the Republican seats we held in the suburbs are solid. Allyson Schwartz, who’s district includes Philadelphia and heads out into Montgomery County, is the only gun hater left in the Philly suburbs. And this is where Bloomberg made his stand, dumped big money, and lost just as big. They tried to make gun control an issue and roundly lost. UPDATE: That finger of blue coming down out of Berks County in the Northwest corner of this map? That’s Tim Holden’s district. Holden voted against Pelosi every step of the way, ran as a conservative rather than a Democrat, and carried an NRA endorsement. He’s a DINO.